This medication is used short-term to treat symptoms of anxiety and nervousness. It acts on certain centers of the brain to help calm your nervous system. Take this medication by mouth with or without food, usually 2 to 4 times daily or as directed by your doctor. Dosage is based on your age, medical condition, and response to treatment. Adults should not take more than 2400 milligrams in a 24-hour period. If this medication has been used regularly for a long time or in high doses, withdrawal symptoms (such as vomiting, shakiness, confusion, and rarely seizures) may occur if you suddenly stop using this medication. To prevent withdrawal reactions, your doctor may reduce your dose gradually. Consult your doctor or pharmacist for more details, and report any withdrawal reactions right away. What conditions does Meprobamate treat? Drowsiness, dizziness, headache, excitement, nausea, vomiting, and diarrhea may occur. If any of these effects persist or worsen, tell your doctor or pharmacist promptly. Tell your doctor right away if any of these unlikely but serious side effects occur: numbness/tingling/swelling of arms/legs. Tell your doctor right away if any of these rare but very serious side effects occur: fast/irregular heartbeat, fainting, signs of infection (such as fever, persistent sore throat), easy bruising/bleeding, signs of kidney problems (such as change in the amount of urine), unusual tiredness. List Meprobamate side effects by likelihood and severity. Before taking meprobamate, tell your doctor or pharmacist if you are allergic to it; or to carisoprodol, mebutamate, tybamate, or carbromal; or if you have any other allergies. This product may contain inactive ingredients, which can cause allergic reactions or other problems. Talk to your pharmacist for more details. Before using this medication, tell your doctor or pharmacist your medical history, especially of: a certain liver/blood disorder (porphyria), kidney disease, liver disease, brain disorders (such as seizures, brain damage), personal or family history of a substance use disorder (such as overuse of or addiction to drugs/alcohol). Older adults may be more sensitive to the side effects of this drug, especially drowsiness and addiction. Drowsiness can increase the risk of falling. This medication is not recommended for use during the first 3 months of pregnancy due to the potential for harm to an unborn baby. During the last 6 months of pregnancy, this medication should be used only when clearly needed. Discuss the risks and benefits with your doctor. What should I know regarding pregnancy, nursing and administering Meprobamate to children or the elderly? Tell your doctor or pharmacist if you are taking other products that cause drowsiness, including alcohol, marijuana, antihistamines (such as cetirizine, diphenhydramine), drugs for sleep or anxiety (such as alprazolam, diazepam, zolpidem), muscle relaxants (such as carisoprodol), and narcotic pain relievers (such as codeine). Does Meprobamate interact with other medications? If someone has overdosed and has serious symptoms such as passing out or trouble breathing, call 911. Otherwise, call a poison control center right away. US residents can call their local poison control center at 1-800-222-1222. Canada residents can call a provincial poison control center. Symptoms of overdose may include: clumsiness, slurred speech, severe dizziness/drowsiness, or slow/shallow breathing. Keep all medical appointments. Your doctor will periodically monitor your progress or check for side effects. Consult your doctor for more details. If you are taking this on a regular schedule and you miss a dose, take it as soon as you remember. If it is near the time of the next dose, skip the missed dose and resume your usual dosing schedule. Do not double the dose to catch up. Store at room temperature away from light and moisture. See packaging or consult your pharmacist for the exact temperature range. Do not store in the bathroom. Keep all medicines away from children and pets. 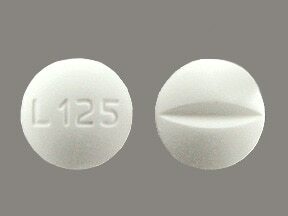 This medicine is a white, round, scored, tablet imprinted with "L 125". 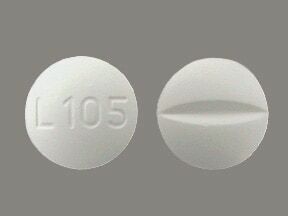 This medicine is a white, round, scored, tablet imprinted with "L 105". 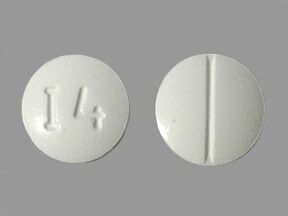 This medicine is a white, round, scored, tablet imprinted with "I 4". 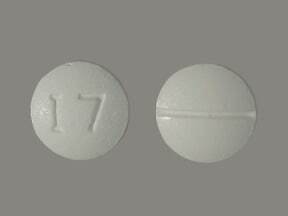 This medicine is a white, round, scored, tablet imprinted with "I 7". Are you considering switching to Meprobamate? How long have you been taking Meprobamate?